You've hung on to them for years — those beloved tees from your favorite concerts, events, vacations and school days. 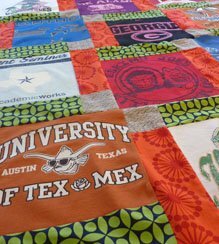 Gather all your old faves and create a beautiful memory quilt! In this 2-class series, you'll learn how to work knit tees into a design and make knits and wovens play nice together. We’ll cover concept, measuring, cutting and piecing to help you create a one of a kind memory you can wrap up! Prerequisite: Students should have a thorough grasp of their sewing machines, be able to sew a 1/4" seam accurately as well as safely and properly cut fabrics with a rotary cutter and ruler. 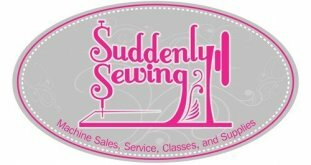 • 3-1/2 yards Knit Fuse Stabilizer (3 yards is enough for 9 T-shirts - if you have more than 9 T-Shirts than purchase 1/2 yard more per each additional shirt)***we have this for purchase here at Suddenly Sewing. • Fabric for Sashing (the fabric that will go between the T-Shirt Blocks. We will pick this out in class once we have our shirt layout finalized) • 12-1/2" Square Ruler • (1) Spool 100% Cotton Thread in either a tan or gray (a neutral color) We'll discuss borders, backing and binding in class and how to make your quilt larger if desired. Please also bring these other sewing items to class: • Sewing Machine in good working order with 1/4" Presser Foot (A MUST) • Rotary Cutter & Rotary Cutting Ruler (at least a 6" X 24") • Basic Sewing Supply Kit and Other Stuff You Always Need such as: straight pins, scissors, marking pencil or pen; seam ripper, notebook and pencil etc... Prior to Class: Please do not cut your t-shirts down until you get to class.